Cut the turnaround time down to 4 working days by paying for the film and the film processing. This puts your order 1st in line without waiting for any one else to fill-up the roll of film. Those costs are $30.00 per roll of 36 exposures. If you order 72 slides it would be 2 * $30 = $60 and 100 slides would be 3 * $30 = $90.00. 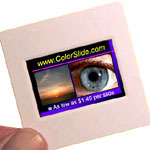 This cost is in addition to your normal slide prices and your shipping choice will take additional days.